SO, enough about me…What’s YOUR “WHY”? Why do I run…why do you run? 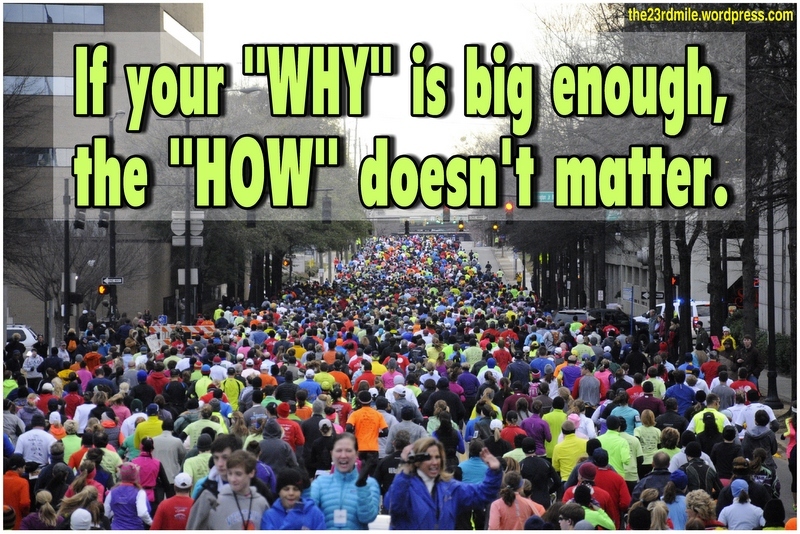 If I were to have an obsession about running…the “WHY’s” have it! Your “why’s” inspire me & I know I’m not the only one that feels this way! Since I can’t seem to get away from this thought…I’ve decided to just “go with it”. I’m devoting a portion of my blog to inspiring each other through sharing our stories. Why do you run? Why did you start? Why do you love it? What’s on your heart to share…I want to know! If you’d like to help rest my mind(please, please, please 🙂 ), submit your story along with at least your first name and last initial to the23rdmile@outlook.com be sure to include a picture(more than one if you’d like)! Also, feel free to let me know about your blog and/or website if you’d like for me to include a link to it. Thank you for sharing! Thank you for inspiring! Categories: running | Tags: 10k, 13.1, 26.2, 5k, C25k, couch to 5k, goals, inspiration, marathon, marathons, run, runners, running, why, why I love running, why run?, your story | Permalink.